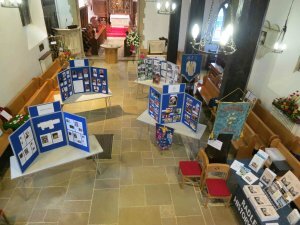 Some 150 people visited Radley History Club’s exhibition in Radley Parish Church during the first weekend in October. The exhibition was based on the Club’s new book, St James the Great, Radley: The Story of a Village Church. The pews and chairs were cleared away to the sides of the church to create a welcoming space for the displays covering various aspects of the Church and its more than 700 years of history. Visitors could find out more about the building itself, the church history which influenced it, and the people who were involved in it, right up to the present day. ‘Fascinating’, ‘excellent’, ‘informative’ and ‘very interesting’ are words that crop up time and time again in the comments from visitors. What a fantastic display and I found out something I didn’t know about my grandfather. Wonderful exhibition – so much we didn’t know. Thank you History Club. Floral arrangements around the Church illustrated key aspects of the life of a village church. Adding further colour were the Sunday School banner and banners dating back to the late 19th century belonging to the Mothers’ Union in Radley and the Girls’ Friendly Society. 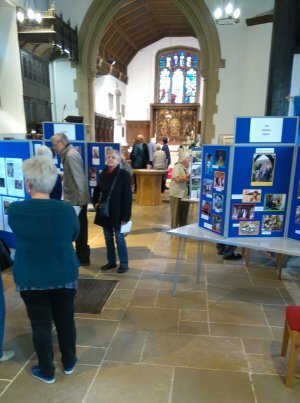 The exhibition was opened by Revd Pam McKellen, who was presented with a signed copy of the book by Club chairman, Richard Dudding. A short peal was rung by Radley Church’s bell-ringing team before the exhibition opened on both days and refreshments were provided in the adjourning Church Room by Radley Women’s Institute. You can see some more photos from the exhibition, including the floral arrangements, on the Club website (www.radleyhistoryclub.org.uk). The website also has details of the new book. Copies are on sale, price £12, from Joyce Huddleston (Tel: 01235 524866 or email publications@radleyhistoryclub.org.uk) or from Radley Village Shop.